NEW DELHI, India, March 30, 2011 (ENS) – India’s population of endangered tigers has increased by 225 animals since 2007, according to the results of the latest census released at the International Tiger Conservation Conference underway in New Delhi. 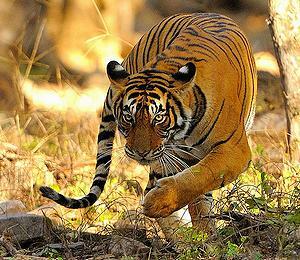 The government estimated tiger numbers at 1,706, up from 1,411 during the last count in 2007. However, the 1,706 figure includes an additional tiger reserve in the count, the Sundarbans, that contained 70 tigers. This area was not counted in 2007. So, when comparing the previous survey with the current one, the official estimate stands at 1,636, excluding the Sundarbans, or an increase of 225 animals. Announcing the new numbers Monday at the opening of the conference, Environment Minister Jairam Ramesh said that close to 30 percent of the estimated tiger population is outside India’s 39 Tiger Reserves. “We do not have complete strategies to deal with this,” he said. There is a considerable rise of tiger numbers in southern states, where Karnataka shows the highest figure of 320 estimated tigers, he said. The count was conducted by India’s National Tiger Conservation Authority with key nongovernmental partners in the largest tiger population survey ever undertaken. Numbering more than 100,000 at the turn of the 20th century, tigers have lost more than 97 percent of their population and 94 percent of their home range in just 100 years. 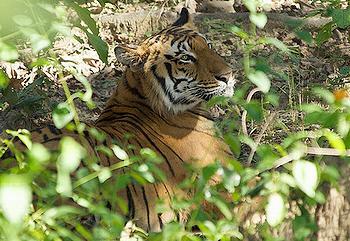 Today, India has half of the world’s remaining wild tigers, and the government supports tiger recovery. Poaching for body parts, illegal trade and habitat degradation have reduced the world tiger population to about 3,200. Lately, conflict with people has emerged as one of the major threats in tiger conservation, particularly in India. Hosted by the government of India, the conference is being held in collaboration with the Global Tiger Forum and the Global Tiger Initiative. The participants include leaders from all 13 tiger range countries, scientists, and conservation organizations, including WWF, the International Fund for Animal Welfare and the Wildlife Trust of India. “These numbers give us hope for the future of tigers in the wild, and that India continues to play an integral role in the tiger’s recovery,” said WWF International Director General Jim Leape. He is chairing a conference session on the role of international and national partners in implementing the Global Tiger Recovery Programme, the first formalized international initiative to save the species from extinction. This worldwide plan to bring the species back from the brink of extinction by doubling the world tiger population by 2022 was forged last November at an international tiger conservation meeting in St. Petersburg, Russia hosted by Russian Prime Minister Vladimir Putin. Vivek Menon, executive director of the Wildlife Trust of India and IFAW’s regional director for South Asia, is on the front lines of tiger conservation. “We have provided training and equipped more than 8,500 frontline staff in India alone. Our field officers have also played a crucial role in securing tiger habitats in a number of Indian states, by facilitating granting them protected area status,” he said. Wild tigers are now found in Indonesia, Malaysia, Cambodia, Vietnam, Laos, Thailand, Myanmar, Bangladesh, Bhutan, India, Nepal, China and Russia.